* Heb 13:14 (in the original: ou gar echomen); Vulgate: “non enim habemus hic manentem civitatem sed futuram inquirimus”. Also quoted by Charles Trimnell, Bishop of Norwich on p. 470. Johann Rudolph Wettstein was the erudite pastor of the church of St. Leonard in Basel, grandson of the famous Swiss politician and mayor of Basel Johann Rudolph Wettstein (1594-1666), who played a role in the Treaty of Westfalien, and whose son (1614-1684) and grandson (1647-1711) of the same name were both renowned professors of theology at the university of Basel. A cousin of this latter was the famous printer and bookseller of Amsterdam Johann Heinrich Wettstein (1649-1726) coming there from Basel. Thus the pastor of the St. Leonard, also called Johann Rudolph, was first cousin of the latter two. His work was published by his son, the theologian Johann Jakob Wettstein (1693-1754): Jo. Rodolfi Wetstenii, Ecclesiae Basiliensis pastoris [patris editoris] Ad reformatas Helvetiae atque foederatarum civitatum ecclesias epistola. Amstelaedami, 1733. 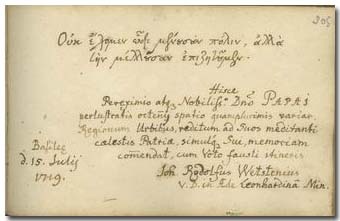 The pastor and his son Johann Jakob Wettstein wrote on the same day in the album of Pápai Páriz (p. 313).